The following private industry notification was published online by RenderMan of RenderLab in late April. The notification concerns claims made by security researcher Chris Roberts about vulnerabilities in “commercial aircraft’s onboard avionics and wireless networks in the aircraft’s cabins or through the aircraft’s In Flight Entertainment (IFE) network.” Through the exploitation of these vulnerabilities, “cyber actors could intrude into the onboard network systems and disrupt or disable the controls of an aircraft.” After discussing some of these vulnerabilities on Twitter, Roberts was detained by the FBI following a United Airlines flight and had his electronic devices seized. 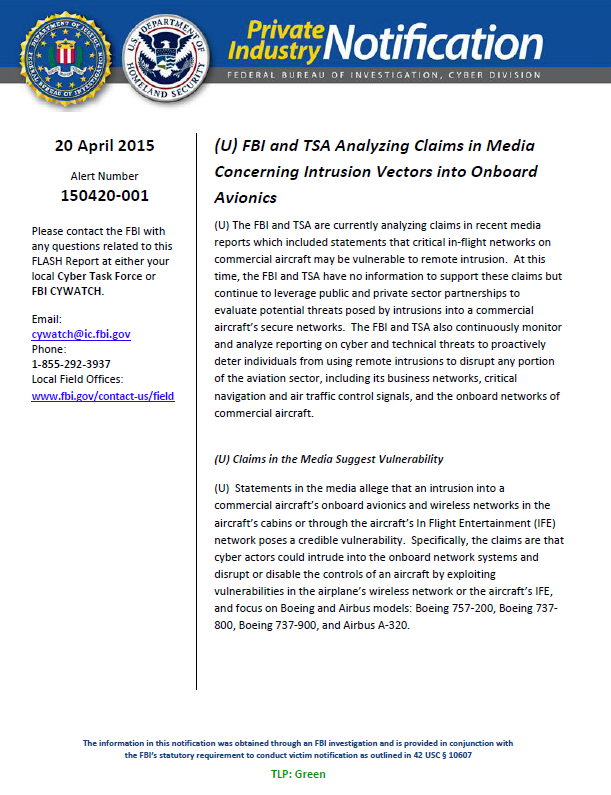 (U) The FBI and TSA are currently analyzing claims in recent media reports which included statements that critical in-flight networks on commercial aircraft may be vulnerable to remote intrusion. At this time, the FBI and TSA have no information to support these claims but continue to leverage public and private sector partnerships to evaluate potential threats posed by intrusions into a commercial aircraft’s secure networks. The FBI and TSA also continuously monitor and analyze reporting on cyber and technical threats to proactively deter individuals from using remote intrusions to disrupt any portion of the aviation sector, including its business networks, critical navigation and air traffic control signals, and the onboard networks of commercial aircraft. (U) Statements in the media allege that an intrusion into a commercial aircraft’s onboard avionics and wireless networks in the aircraft’s cabins or through the aircraft’s In Flight Entertainment (IFE) network poses a credible vulnerability. Specifically, the claims are that cyber actors could intrude into the onboard network systems and disrupt or disable the controls of an aircraft by exploiting vulnerabilities in the airplane’s wireless network or the aircraft’s IFE, and focus on Boeing and Airbus models: Boeing 757-200, Boeing 737-800, Boeing 737-900, and Airbus A-320. (U) FBI and TSA evaluate potential cyber or other technical threats to commercial aircraft’s avionics networks. The FBI and TSA work with other government agencies and leverage private sector partnerships to prevent or deter individuals from attempting to use remote intrusions to disrupt any portion of the aviation sector, including its business networks, critical navigation and air traffic control signals, and the onboard networks of commercial aircraft and to decrease the likelihood of any malicious cyber intrusions into commercial aircraft. – (U) Report any suspicious activity involving travelers connecting unknown cables or wires to the IFE system or unusual parts of the airplane seat. – (U) Report any evidence of suspicious behavior following a flight, such as IFE systems that show evidence of tampering or the forced removal of covers to network connection ports. – (U) Report any evidence of suspicious behavior concerning aviation wireless signals, including social media messages with threatening references to Onboard Network Systems, ADS-B, ACARS, and Air Traffic Control networks. (U) Review network logs from aircraft to ensure any suspicious activity, such as network scanning or intrusion attempts, is captured for further analysis.